Two aspects of the EEG literature lead us to revisit mu suppression in Autism Spectrum Disorder (ASD). 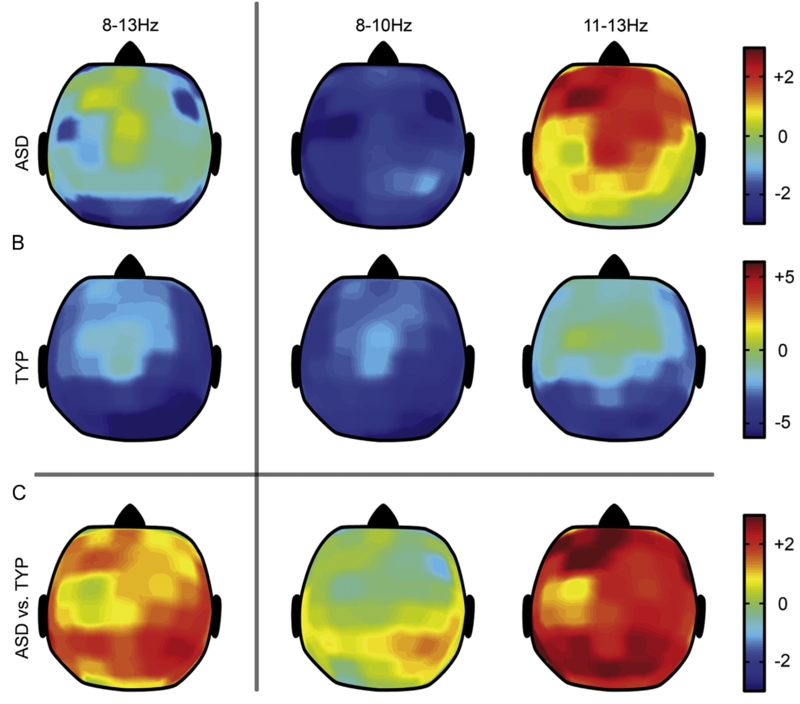 First and despite the fact that the mu rhythm can be functionally segregated in two discrete sub-bands, 8–10 Hz and 10–12/13 Hz, mu-suppression in ASD has been analyzed as a homogeneous phenomenon covering the 8–13 Hz frequency. Second and although alpha-like activity is usually found across the entire scalp, ASD studies of action observation have focused on the central electrodes (C3/C4). The present study was aimed at testing on the whole brain the hypothesis of a functional dissociation of mu and alpha responses to the observation of human actions in ASD according to bandwidths. Electroencephalographic (EEG) mu and alpha responses to execution and observation of hand gestures were recorded on the whole scalp in high functioning subjects with ASD and typical subjects. When two bandwidths of the alpha-mu 8–13 Hz were distinguished, a different mu response to observation appeared for subjects with ASD in the upper sub-band over the sensorimotor cortex, whilst the lower sub-band responded similarly in the two groups. Source reconstructions demonstrated that this effect was related to a joint mu-suppression deficit over the occipito-parietal regions and an increase over the frontal regions. These findings suggest peculiarities in top-down response modulation in ASD and question the claim of a global dysfunction of the MNS in autism. This research also advocates for the use of finer grained analyses at both spatial and spectral levels for future directions in neurophysiological accounts of autism.